BGpay（Banggood Wallet） is a convenient, fast and safe payment method for Banggood users. 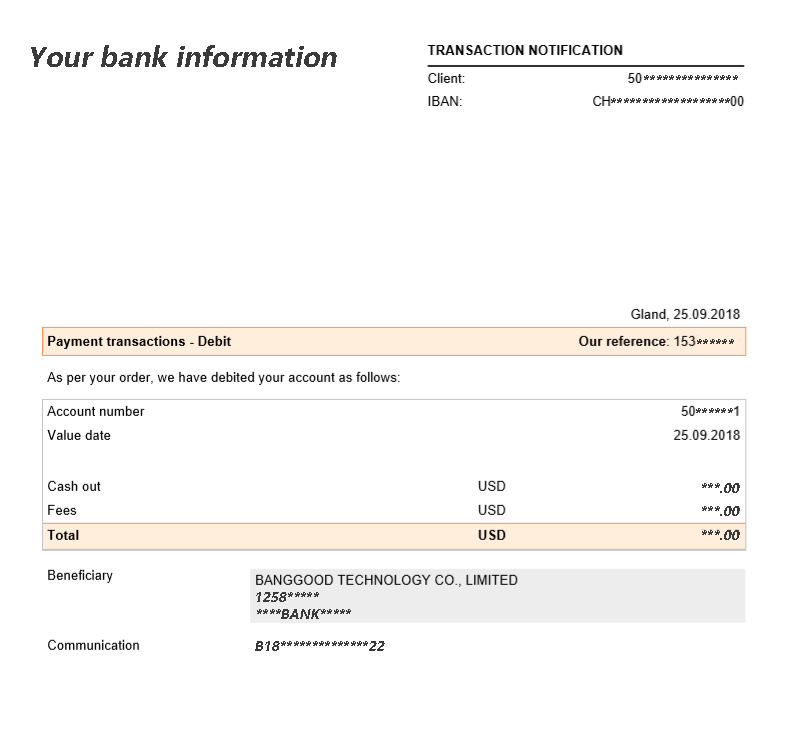 You can top-up money into your BGpay account and then use the balance to pay for Banggood orders. Order refunds can also be sent directly to your BGpay account. You can watch this video for more information. Why should I use BGpay? Enjoy fast and secure payment. Where can I access the BGpay? On the “My Orders”> “Unpaid Orders”. How do I activate BGpay? Step 1: Verify your email address. We’ll send a verification email, open the email and click the verification link. Step 2: Set your payment password: create an 8-16 character password, containing letters and numbers. This password is required when making payments or account changes. Step 3: Set your security questions (optional). Security questions are used when you reset your password. For maximum security, we strongly recommend you set answers that only you would know. How do I top-up my BGpay account? Step 6: We will confirm the transaction and process the top-up within 1 business day from the day we receive your Transfer Receipt. How do I receive a refund into my BGpay account? If you cancel your order from the order status page, our system will automatically generate a refund request. If you selected to receive the refund into your BGpay account, the refund will be transferred when customer service authorizes the transaction. Contact our customer service team and ask for a refund, the request will be handled in the same way as our regular returns/refund policy. When making the request, ask our service team to transfer the refund to your BGpay account. How do I pay with BGpay? Step 5: Enter your payment password. Can I withdraw my BGpay balance? ①An order refund credited to a BGpay account can be returned to the original payment account, the request must be made within 120 days from the date of the original order payment. ②Funds added via Wire Transfer Top-up, affiliate withdrawal credit and promotion rewards cannot be withdrawn. ③Frozen Funds cannot be withdrawn. ④If your original order is paid by Doku wallet/ATM Indonesia/Alfamart/Konbini/COD, please contact us to withdraw. Funds that cannot be withdrawn can only be used to pay when shopping on the website. How do I withdraw money from my BGpay wallet? Enter the amount you would like to withdraw and click withdraw. The funds will return to the PayPal account or credit card from which the original payment was taken. How long does it take for the money withdrawn to appear in my account? Please check our expected refund processing times for specific details. Please keep in mind that funds are returned to the PayPal or credit card account that was used to make the payment. Is my BGpay balance safe and secure? All BGpay transactions require your payment password. Provided you use a strong password and keep it a secret, your account will remain secure. How can I check the transaction records of my BGpay? What can I do when my account has been frozen due to entering the incorrect password too many times? If you incorrectly enter the password more than 3 times in 24 hours, your account will be temporarily frozen. Your account will be automatically unfrozen after 24 hours. How can I change my security questions? Step 3: Click the link in the email to confirm the change. How many BGpay currency wallets can I have? You can have multiple currency accounts. The default account is in USD, and you can also have other accounts in another (Not USD) currency. How can I create the second currency (NOT USD) BGpay account? Non USD currency accounts are automatically created when you ask for a refund to be paid in your local currency. You are unable to access or use your BGpay account. Thank you for submitting your feedback about this article!